Which technologies are affecting future mobility? Will new vehicle concepts stand up to traditional cars? How are automotive value chains shifting? These three questions are affecting not only the automotive industry but also the new players changing the automotive world. The key to new and successful products on the market is the cooperation between large and medium-sized companies as well as scientific institutions. Hence innovative companies are looking for creative routes to new solutions more and more. “Zulieferer Innovativ 2016” is the leading congress of the Bavarian Automotive Cluster and highlighted the latest trends and innovative solutions for mobility and vehicle development. 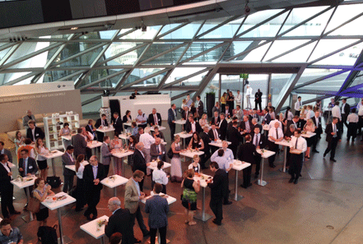 The congress offered a thematically focused platform for the direct dialog among representatives of industry, science, and policy in an inspiring atmosphere of BMW Welt Munich. Since the executive search consultants of our automotive practice are serving a range of international automotive clients in China, the event in Munich was a great opportunity to keep in touch with the community.